We recently welcomed our Canadian partners, ClipperTelemed+, to Clipper Race HQ in Gosport for Skipper and Medical Assistant Crew training courses. For the third consecutive race, ClipperTelemed+ by PRAXES will be on call 24/7 to provide crew and skippers with medical advice for the duration of the race, including each stopover. The training, which took place in the classroom and on board one of the Clipper 70 yachts, covered a comprehensive range of topics which taught participants how to safely use the ClipperTelemed+ medical equipment whilst practically applying medical techniques whist racing. Overseeing the training was ClipperTelemed+ Medical Director Dr John Ross and Dr Carl Jarvis, who have both worked for ClipperTelemed+ since the start of the Clipper Race partnership in 2013 and for the parent company, PRAXES, since 1997. “We have gone through everything that could possibly happen from the top of your head to the bottom of your feet. We have discussed common medical issues like rashes and aches to more advanced cases. 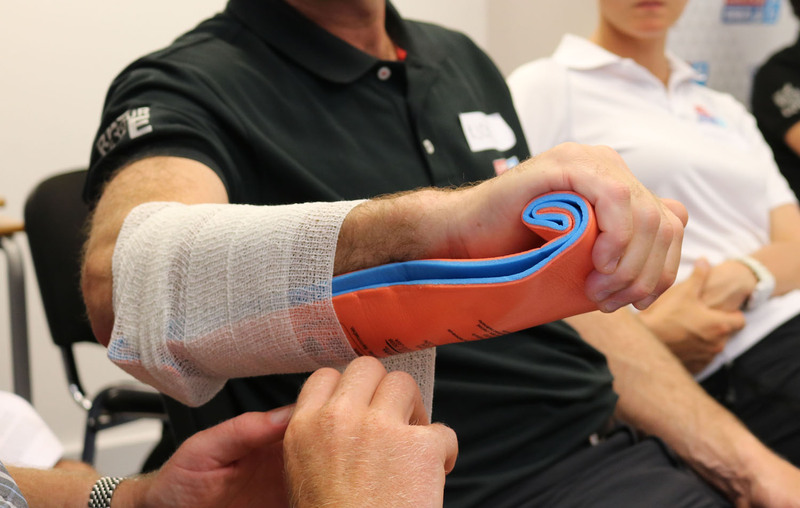 “This training allows Clipper Race Skippers and Medical Assistant crew to have hands on experience of the ClipperTelelmed+ kit that will be on board. Many of the Medical Assistant Crew, who have volunteered to take on the non-sailing role in addition to their regular crew duties, have significant medical experience and include GPs, Nurses and Paramedics. The Medical Assistant Crew are trained to support their skipper should medical treatment be needed during the race. “The ClipperTelemed+ training prior to the Clipper Race is highly important and valuable,” says Daniel. “We find that Skippers have done medical training and are equipped to deal with medical emergencies on board, but what we have here is very specific training which is designed to work for Clipper 70’s with the exact kit that we have on board. “As a Clipper Race Skipper, it is reassuring to know that there is a ClipperTelemed+ doctor at the end of the phone 24/7 who knows exactly what equipment you have on the boat with you, where its kept, they know the conditions that you are dealing with and they are able to give you practical advice which is what you need at the time. Clipper Race Skippers and some 700 crew are now in the final stages of preparations before race start on 20 August. Think you have what it takes? To apply, click here.